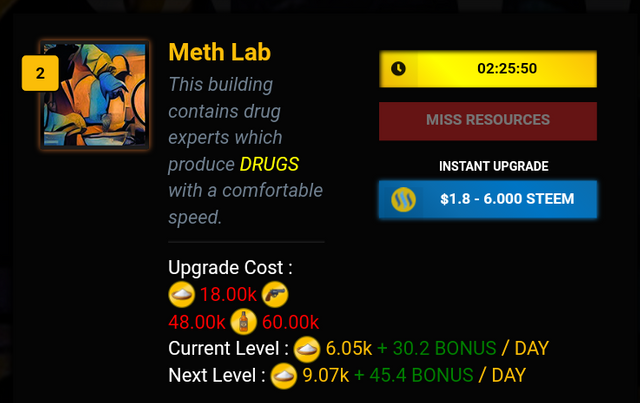 I am in the process of creating tables for the game DrugWars with the upgrade costs and production rates per level. But unfortunately, I still lack many values. If you have already reached higher levels, I would like to ask you to post a screenshots of the missing values as a comment below this post, so that I can extend the tables. Ich bin dabei, für das Spiel DrugWars Tabellen mit den Upgrade Kosten und Produktionsraten pro Level zu erstellen. Aber leider fehlen mir noch viele Werte. Falls Ihr schon höhere Level erreicht habt, möchte ich euch bitten einen Screenshots von den fehlenden Werten als Kommentar unter diesen Beitrag zu posten, damit ich die Tabellen erweitern kann. 8 ? ? ? ? ? 9 ? ? ? ? ? Thank you, i've added your infos. You also forgot to edit the chart with Cocina lvl 2, which I already posted. The requirements for the level 2 Cocina you've described are actually for level 3. Sorry, I kinda sorta forgot about your project, then suddenly remembered about it a few minutes ago. Here are some extra levels for you. Got your missing Pharm Lab numbers! Thank you, i added the values to the table. Your UA account score is currently 6.781 which ranks you at #113 across all Steem accounts. In our last Algorithmic Curation Round, consisting of 192 contributions, your post is ranked at #80.